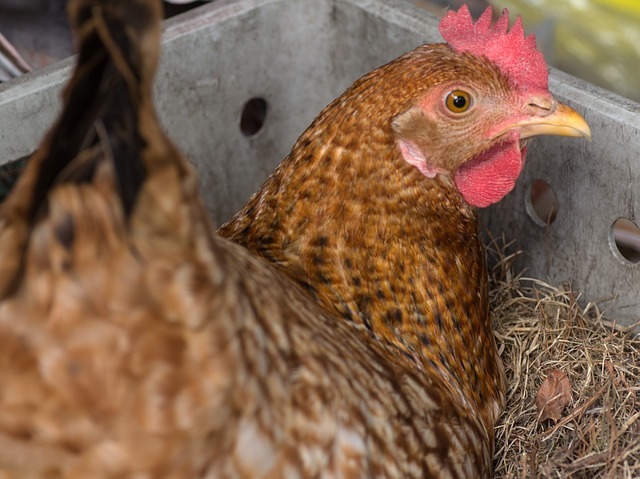 Chicken nesting boxes encourage hens to lay their eggs in a clean, safe place. One of the best perks of a good nest box is that you can find the eggs easily. Fortunately, you don’t have to spend lots of money on chicken nesting boxes. They can be made out of many common household items and materials. We’ve gathered some of our favorite simple DIY chicken nesting box designs. You can build chicken nesting boxes out of many materials. Wood, metal and even plastic can be used. The nesting boxes should be lined with soft bedding. While wood shavings work, chickens prefer to lay in hay, straw or even soft, dry moss. You’ll need one nest box for every 3-4 hens. Some people get by with fewer nesting boxes, but you risk hens laying elsewhere because the box is full when she wants to lay her egg. To help inspire you when building nest boxes, we’ve gathered a few examples. Here are five easy, cheap and functional homemade chicken nesting boxes. Buckets make great nesting boxes. It is best if you place a bar across the bottom to prevent the eggs from rolling out. This is a creative use for old wheels. Really, anything that can hold a nice pile of straw bedding will make cozy chicken nesting boxes although some hens prefer a nest box that is covered for extra privacy. All you need for these custom chicken nesting boxes is a little lumber and a few tools. If you aren’t keen on sawing or hammering, use milk crates to build quick chicken nesting boxes. You can hang them creatively as shown in the image above, or you can simply set them on the floor of the chicken coop filled with bedding. Chicken nesting boxes can be simple. This easy design can be made with a few pieces of scrap lumber. If you don’t feel up to building your own chicken nesting boxes, you can find a number of beautiful nesting boxes for sale. Single Chicken Nesting Box – This plastic chicken nesting box is easy to clean and is extra large to accommodate even the biggest of hens. 10 Place Metal Chicken Nesting Boxes– Of all the metal nesting boxes for sale, this is one of the best designs. It’s easy to assemble, easy to clean and the hens love it. 2 Place Metal Nesting Box – For a small flock this two place nesting box is ideal. It has convenient wooden roosts for easy access. You may also like Mobile Chicken Coop that comes with some nesting box at www.thechickentractor.com.au. Learn to build chicken nesting boxes quickly with this step-by-step guide.